Set amidst the picturesque alpine backdrop of Sun Peaks Resort, the Women’s Only Weekend is a retreat designed to inspire, rejuvenate and empower women of all ages. The 3-day event features a variety of all-female workshops, activities and seminars tied together by the theme of personal growth. The event kicks off on Friday, September 13th with a welcome reception and wine tasting at which participants can mingle and enjoy some wonderful Okanagan wine. Over the rest of the weekend, participants can choose from a smorgasbord of events to create an experience tailored to their individual goals. For those looking to learn something new, the WOW’s “speakeasy” seminars instruct participants in various topics including healthy eating, spiritual growth, makeup, finance and photography. For those who wish to invigorate their body as well as their mind, the event offers a range of fitness, yoga and meditation classes including Zumba and Bellyfit. Sun Peaks is also a great place to enjoy hikes and nature walks through beautiful mountain trails, either with WOW or on your own. The centerpiece of the WOW event is a lunch seminar from keynote speaker and Olympic champion Nancy Greene, taking place on Saturday at 11:30. A 3-Day pass to the Women’s Only Weekend is $225. This includes the welcome reception and wine tasting, keynote seminar with Nancy Greene, Saturday evening wine tasting and your choice of 3 other WOW events. You’ll also get a free yoga mat from Roxy Outdoor Fitness! The Hearthstone Lodge is pleased to offer special rates for WOW visitors. Enter the promo code “wow213” for the discounted rate of $75 for studios or $95 for lofts when booking your accommodations for September 12th to 16th. 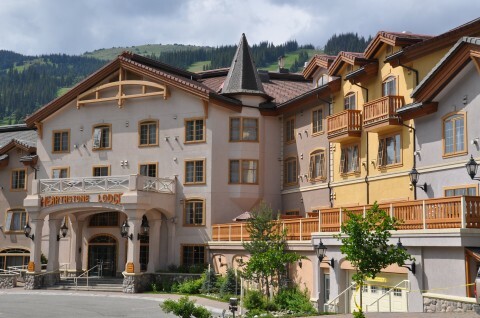 Our hotel is located in the heart of the Sun Peaks village, just steps from the WOW events!